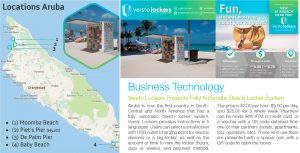 Aruba is now the first country in SouthCentral and North America that has a fully automatic beach locker system. Versto Lockers provides instructions in 5 languages. Users can select a small locker with USB outlet (charging point for electric devices) or a big locker, as well as the amount of time to rent the locker (hours,days or weeks), and payment method. The price is $2.00 per hour, $5.00 per day and $25.00 for a whole week. Payment can be made with ATM or credit card, or a voucher with a QR code obtained from one of their partners (hotels, apartments,tour operators, etc.). Those who use them are presented with a special coin with a QR code to open the locker.